Gaithersburg opened its first Trojan Invitational by honoring three longtime high school track and field coaches: Fred Joyce, Fran Parry, and Herb Tolbert. Joyce's wife, Celeste Joyce, accepted the award on her husband's behalf. 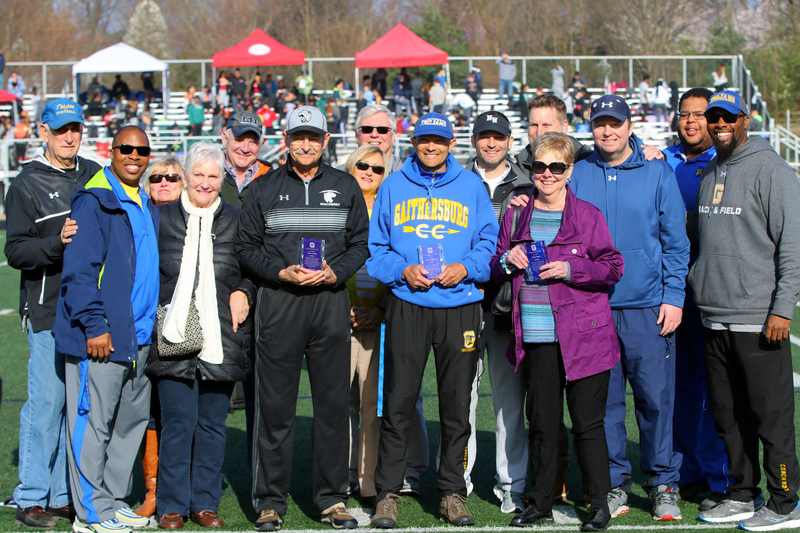 "You can't have a first Trojan Invitational without honoring the trailblazers: Mr. Joyce, Mr. Parry, and Coach Tolbert, because they set the standard," said Gaithersburg High School track coach of 17 years, Adrian McDaniel. What made the coaching trio so great? They stuck together as a unified force for 20 uninterrupted years, they cared deeply about their athletes, and they won a lot. More on longevity and winning later. At 9:00 AM Saturday morning, McDaniel called Tolbert and Parry to the 50 yard line along with more than a half dozen representatives from Fred Joyce's family. It was only then that Tolbert and Parry realized that McDaniel had planned a surprise ceremony. "Coach McDaniel had always sworn that as soon as we had an invitational here that he was going to do something and I never suspected it," said Tolbert, "but I kind of got a hint when I saw Coach Joyce's wife. Just thinking about it now...[long pause]...it's emotional. We miss Fred. We miss Coach Joyce. But anyway we are here for a happy occasion." Tears during the ceremony were somewhat unexpected. Joyce, Parry, and Tolbert had been inducted into the Gaithersburg High School Athletics Hall of Fame in 2015, but as far as anyone knew, that was the only other time that the three had be ceremoniously honored for their lifetime accomplishments. Joyce's poor health at the time cast a shadow over the Hall of Fame ceremony. Joyce could not attend that ceremony and passed away a few months later. Three years removed from Joyce's passing, Saturday morning was the first time that the spotlight was put on all three coaches for track & field accomplishments with Joyce's family properly represented. The moment was bittersweet because it celebrated the storied careers of three men while also conjuring memories of Joyce's passing. Said McDaniel, "It was emotional for me because I wanted to honor them. Those are the ones that paved the way...paved the way for me because I was a runner for them, and they did a lot not just for track & field but for the Gaithersburg community." The type of longevity demonstrated by the three coaches working together from 1982 to 2002 is unparalleled in the history of the sport in Montgomery County and will probably never be matched again. Those 20 years were the pinnacle of the glory years for Gaithersburg (if 20 years can be called a pinnacle), but each coach individually can be celebrated for 40+ year careers. Joyce began coaching at Gaithersburg after he graduated from the University of Maryland. He immediately began coaching physical education, football and track & field in 1966. He retired from teaching after 41 years in 2007. He continued to help the Gaithersburg track team for a few more years, particularly to coach 5-time shot put state champion and All-American, Sean Stanley, through his graduation year in 2009. Joyce passed away in January 2016 at the age of 74. Tolbert began working with the distance program as a young man in 1972. He lifted the Gaithersburg girls track & field and cross-country programs off the ground beginning in 1973, and he hosted the Gaithersburg Relays for girls between 1975 and 1978. He is still the head distance coach in 2019, but don't paint him into a box as just a distance coach. He is always found near the high jump mat and will step in and coach any event when needed. Parry left the Northwood High School track team to become a Trojan in 1982. He stepped away from the Gaithersburg program for the first time in 2003, after his son, Nathan Parry, graduated from Gaithersburg. Adrian McDaniel took over as head track coach in 2003, but Parry was lured back to help Joyce, Tolbert, and McDaniel for several more years and even won one last team state title as Gaithersburg's head indoor track coach in 2009. He has been an assistant coach at Northwest High School since 2013. As you can see, the three started and stopped their careers at Gaithersburg at different times. It is not so simple to attribute all of Gaithersburg's historical track & field successes to just three coaches, but McDaniel felicitously characterized the three as trailblazers. The inscription on each trophy read: "A Trailblazer, Mentor, Teacher, Friend and Coach. Thank you for all your Hard Work and Dedication in making Gaithersburg Track and Field an Outstanding Program. You have started a great legacy at GHS that will continue forever. GHS Family." Gaithersburg won six outdoor track boys team state titles, which is more than any other Montgomery County boys team: 1965, 1966, 1986, 1998, 2000, 2002. Gaithersburg won one indoor track boys team state title (2009) and three boys cross-country team state titles (1961, 1971, 2000). Gaithersburg won 71 outdoor track state titles in boys events and 40 outdoor track state titles in girls events. 32 of those state champs were in sprint events and sprint relays, 26 in jumping events and pole vault, 14 in distance events, 7 in hurdle events, and 12 in throwing events. Gaithersburg won 23 state titles in indoor track events and 3 individual state titles in cross-country. Gaithersburg won 191 outdoor county titles in individual and relay events, still to this day 99 more than any other school since 1980. Gaithersburg won 83 indoor county titles in individual and relay events, more than any other school. Gaithersburg tallied 30 county titles in the shot put alone in the 30 years between 1980 and 2009. Gaithersburg won 18 of 19 county titles in the boys 4x100 relay between 1986 and 2004. Gaithersburg won ten indoor track team county titles between 1990 and 2005. Gaithersburg won only four team titles in outdoor track county championship meets, but that was because the outdoor county championship meet was usually unscored before 2005. If you ask why the outdoor county championship was unscored almost every year between 1981 to 2004, some people will tell you that it was to put focus on individuals. Some sources will tell you that it was to keep Gaithersburg from winning every year. Gaithersburg certainly would have won the outdoor county title most years if it had been scored. Gaithersburg won 18 boys and girls 4A West Region titles between 1991 and 2005. Gaithersburg won 32 outdoor track division titles between 1980 and 2012. The school building that Tolbert, Joyce, and Parry taught out of for decades was demolished in 2013 and replaced with a beautiful new building with top notch athletic facilities. The eight lane track with synthetic turf football field, pole vault runway, dual high jump mats, and throwers circles had never hosted a major meet until Head Coach Bryant Adams moved across town. "I didn't even know they had not hosted a meet at this new stadium," said Adams who hosted more than a dozen meets at Watkins Mill High School in five years there. "So I said, 'We have to showcase this beautiful facility.' So Coach Herb, Coach Hotdog [McDaniel], they were on board with it, they were ready to go and here we are." McDaniel echoed his sentiment and also credited Gaithersburg's new athletic director, Will Gant. Said McDaniel, "We figured it was overdue and Adams came over, we put our brains together and said we definitely need a Trojan Invitational. Everything came together. We got a new AD. Will Gant came and he said it'd be a great idea." Tolbert remembered the last time that Gaithersburg hosted an invitational track meet and it was a very long time ago. The Gaithersburg Relays were created for girls in 1975 and lasted until 1978. Tolbert said they stopped doing it because track as a high school sport became co-ed and there was no longer a need for an all-girls meet. But why wait 41 years to host another invitational? "We didn't think that we had the facility to do it," said Tolbert. "The other coaches were involved in different sports [football and basketball]. Now we've got a track staff and it's all about track. It's not about anything else. Plus we wanted to showcase what we have here...Coach Bryant Adams has taken over and he's all about track. He ran a meet at Watkins Mill and he wanted to bring that here so it was just a natural thing to do." 39 teams were registered for the Inaugural Trojan Invitational. Stadium seating was packed and the parking lot was overflowing. Adams and McDaniel said the meet is most definitely continuing next year, and all alumni are invited to return to see the spectacle. You've got the makings of a great meet. Ditch the JV races. There are plenty of other opportunities for them. Also the parking situation was a nightmare so that needs to be addressed. I think it’s really cool that they have jv events— it allows kids to race people of their caliber and not have them run to just get lapped by vets. What would happen if there were only 30 rather than 40 schools running? So...retract the field and run JV races for a slightly shorter meet, keep the meet where it's at for a tortuously long meet, or aim higher and enforce entry standards to create one of the most elite meets around. Shorten the meet and alleviate parking woes at the same time with tough entry standards. Worst meet ever. It was poorly executed. There was too much ti.e between heats. The ceremony for the past three coaches should have been done earlier - and who cares if not from Gaithersburg high school. The girls 800 was very unorganized and results did not not all the runners who stayed! Correction - the complete girls 800 did not have times for many runners. What a waste of time waiting there! Positive was great facilities. Just a money making opportunity. Great article KP! What's not written in the article about the accomplishments of Joyce/Tolbert/Parry is the impact that they have/had on young men. It's fitting because it's 20 years this year since I graduated from Gaithersburg. I was fortunate enough to spend a little over a year there after transferring. Plain and simple, I am not where I am today or who I am today without Joyce/Parry/Tolbert. I was a distance runner but all three of them had a big part in helping a young man with a lot going on, find his way. And this is just me, one person. There must be so many like me over the decades that they have done so much for...I'm so glad to see that coach McDaniel arranged this well deserved ceremony...one last thing about the comments on the quality of the meet...show me another first year meet with 39 teams that show up. Good luck. That's a ridiculous amount of teams for a first year meet and it wasn't by accident either.